Hello, friends! I’m back! And just in time to go away again… but this time, I’m taking you with me. And because it’s chilly and grey up north, let’s head further south. Maybe somewhere tropical. Perhaps a place where we can go to the beach? Or to the mountains? Or visit a rainforest? But let’s not spend too much, and let’s not leave the US. DONE. Because this week, I’m coming at you from Puerto Rico, US territory since 1898. AND I AM SO EXCITED. About a year and a half ago, my boyfriend Bobby and I traveled through the San Juan airport en route to another destination. 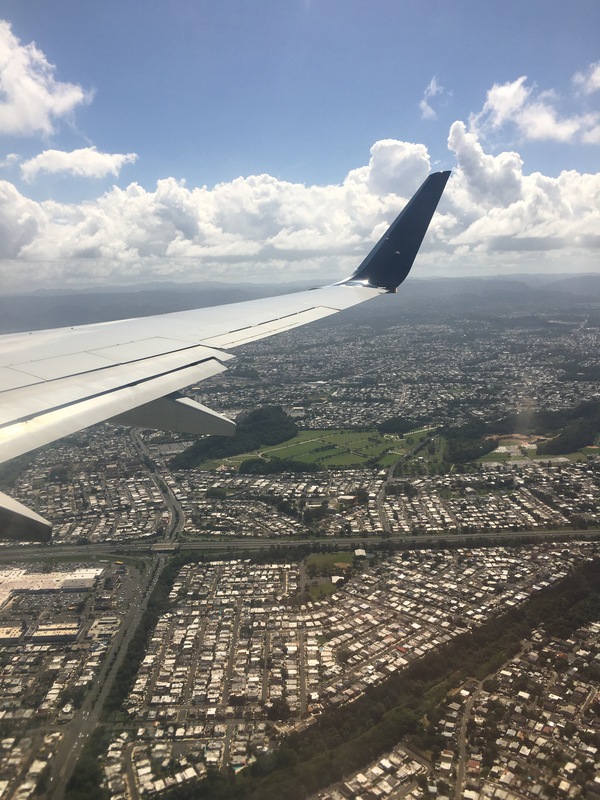 As we were descending into the airport, Bobby and I took a few quick looks out the window, and both agreed that San Juan was too beautiful, and we should try to visit if we could ever get the chance. Months passed, and every so often, I would come across an ad that screamed JOIN US IN PUERTO RICO. 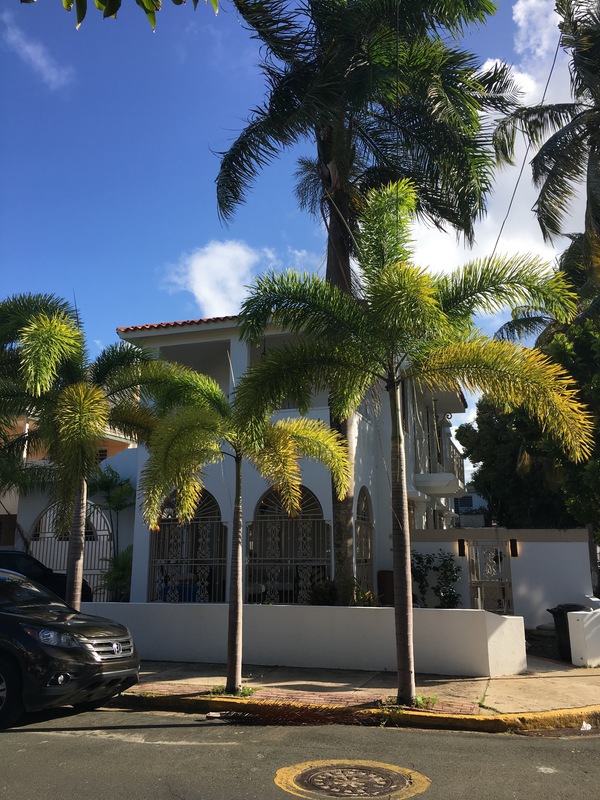 I stumbled across pictures on Instagram of sparkling lagoons and bright blue waters with mountains in the background, with little captions reading, “FAJARDO, PUERTO RICO.” On one of my favorite travel blogs one December day, I saw a stunning guesthouse in San Juan called The Dreamcatcher, which, to my shock when I looked it up, was affordable. 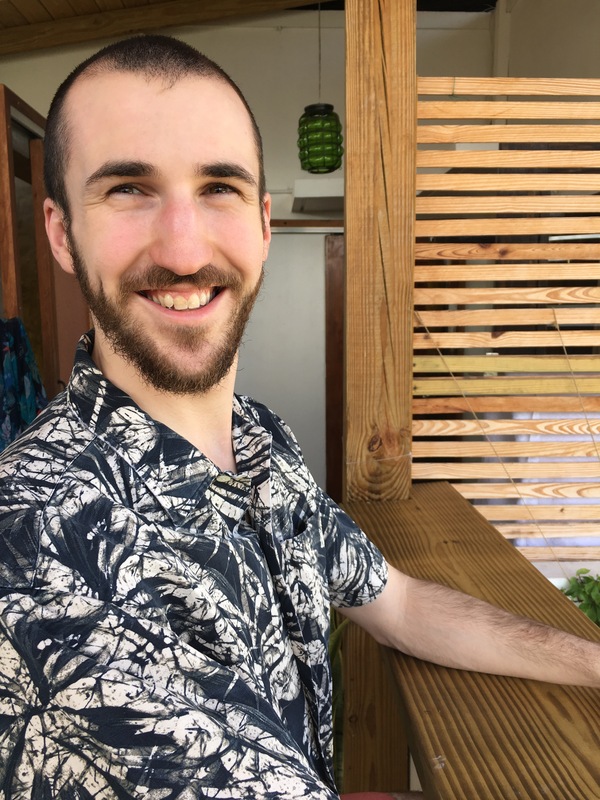 Still, it was a pipe dream — tickets and hotels and food all add up quickly, and there was never time in my schedule. Half-jokingly, I mentioned we should go to Puerto Rico, because I had just seen these ads on the Metro that were advertising “cheap” flights to San Juan. 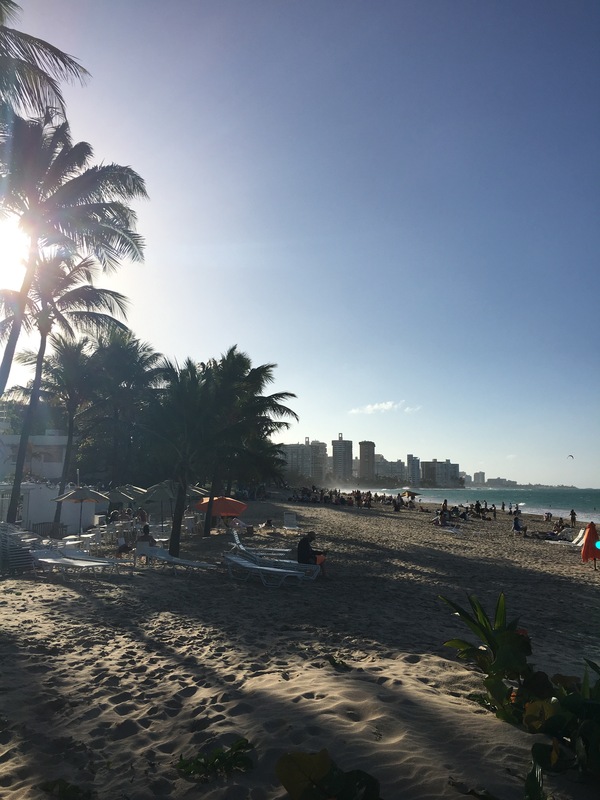 We started browsing destinations and adding up figures… and lo and behold, those “cheap” San Juan flights really were cheap. And the more we looked, the more excited we got. And things started to fall into place: hotels booked through points and work bonuses. Flights handled from our travel fund. And that is why on February 5th, we woke up at an unnecessarily early hour to catch a plane, and then another plane… and by lunchtime, this was our view. We’re HERE! From the airport, we went straight to our hotel — and yes, this is the very same guesthouse I saw a year ago on that blog. 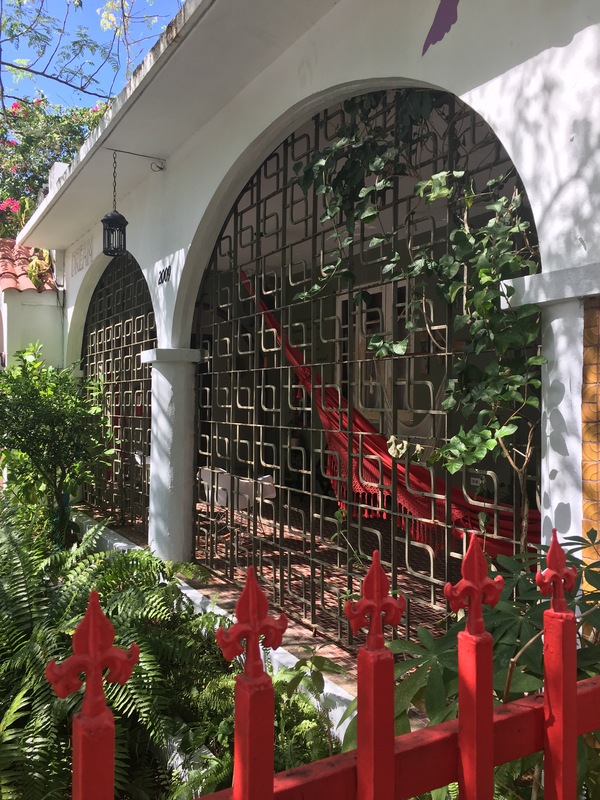 It’s called The Dreamcatcher, and they had ONE room available for our first night in town, so before we head out of San Juan to do some exploring, we’ve made this our home base. The Dreamcatcher is SO BEAUTIFUL, guys. We walked in and were ushered into this fabulous living room waiting area, with fresh iced tea and Puerto Rican coffee and a gentle smell of incense. There were fountains. Outdoor showers. 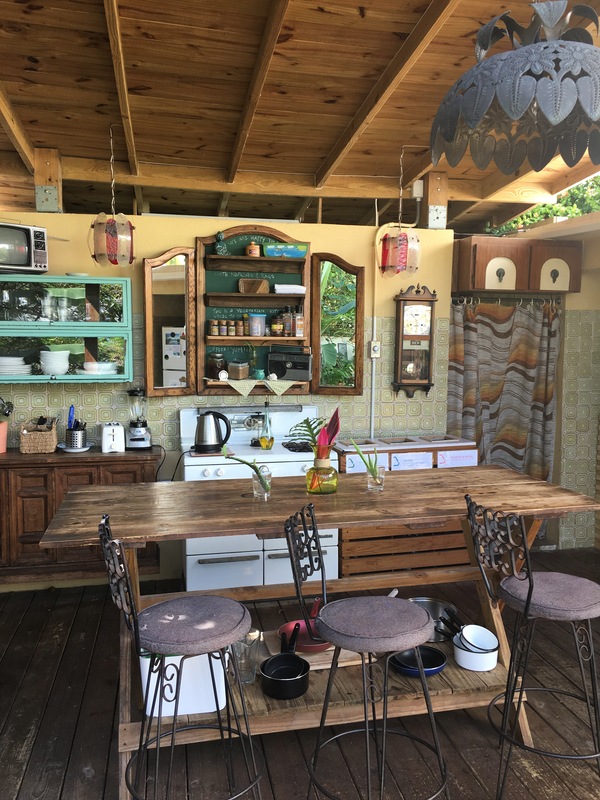 And… an outdoor… kitchen? After a short while, our rooms were ready, and we rushed up the stairs to the suite. And THIS WAS THE VIEW. A very happy Bobo takes in the sights in his fun shirt. 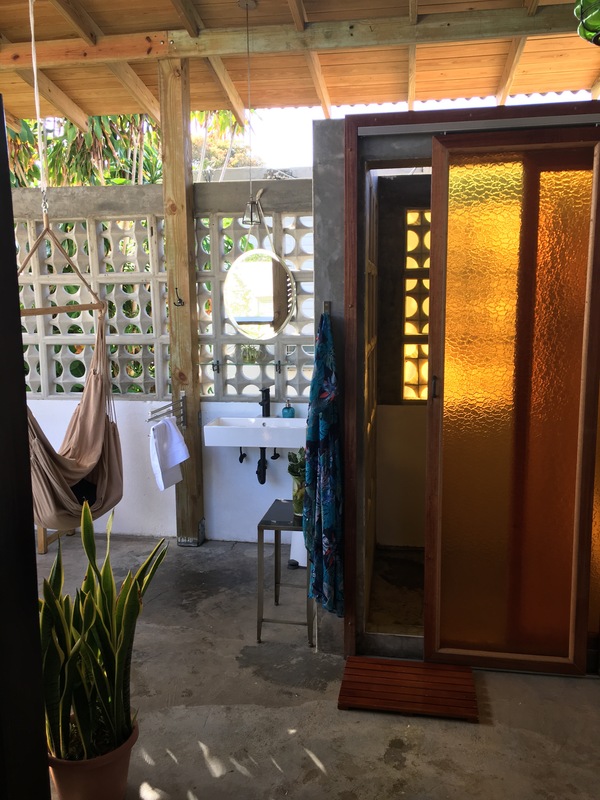 The PORCH with an outdoor shower (yes, fully private, and not something we have to share! ), and TWO swinging seats. After we’d had some time to settle in, we decided to take a good look at the map that the guesthouse owners had made for newbies in town. We found a sandwich joint nearby and headed that way for Cubanos. Funny enough, the restaurant that we stopped into was none other than Kasalta. 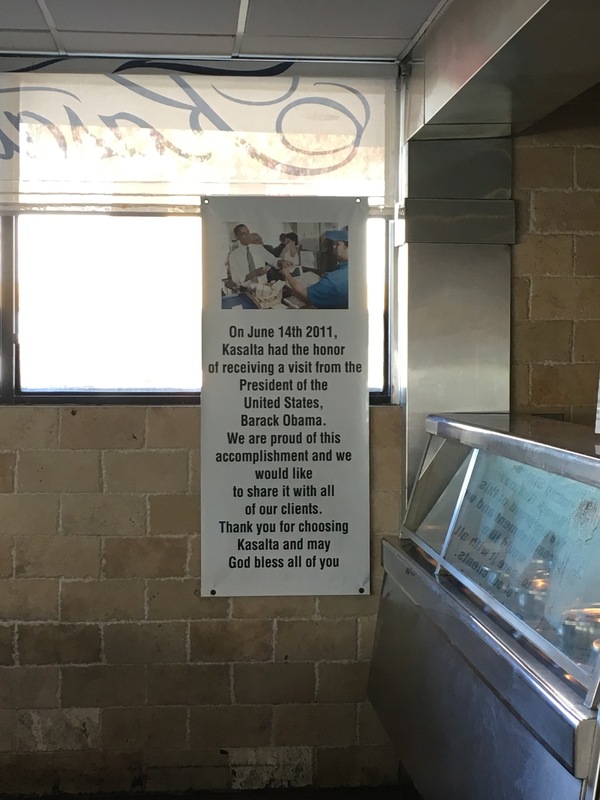 This bakery has the distinct honor of being the place where President Obama had lunch on his trip to Puerto Rico in 2011 (the island’s first presidential visit since 1961!). They take great pride in this fact, as evidenced by their giant banners… and the large plaque on one of their tables. While we were waiting for our sandwiches (one Cubano and one of the “president’s choice!” sandwich), we got lucky, and the Obama table opened up. So naturally, we sat right down, and got the chance to sit where HISTORY HAD BEEN EATEN. 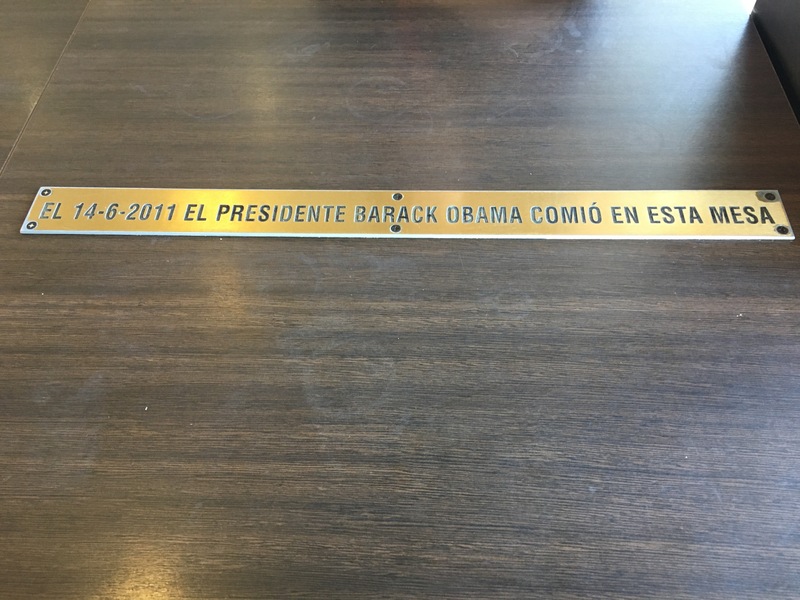 Plaque roughly reads, “On the 14th of June, 2011, President Barack Obama ate at this table.” Wow. After lunch, it was time to take a walk towards the beach. The Dreamcatcher is only TWO blocks from a semi-public beach. Not having worn swimsuits to the restaurant (I mean, we didn’t want to offend the memory of the president’s sandwich! ), we just decided to walk the beach, shoes in hand. 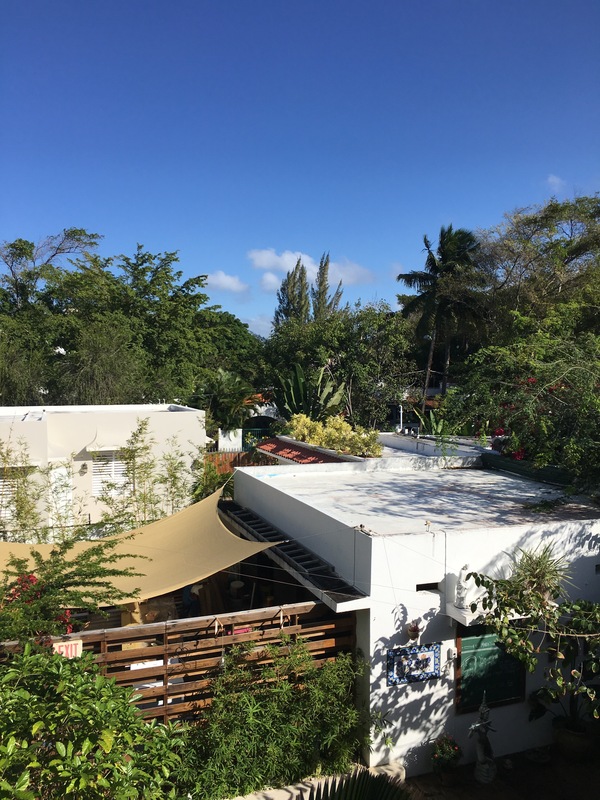 In the background here, you can see the larger buildings of the “downtown” area of San Juan. The beach was crowded but not terribly so. Most exciting was the abundance of unleashed (and VERY well-behaved) dogs. 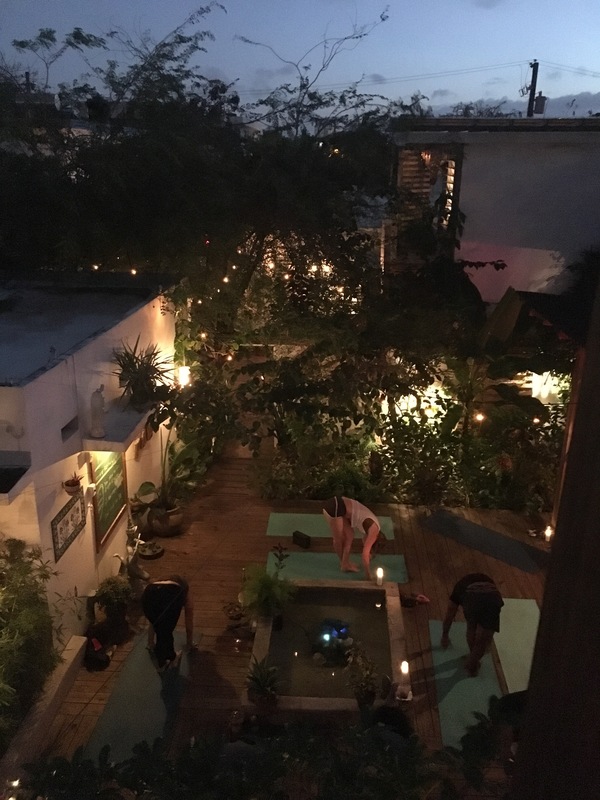 After the nap, we didn’t plan for much, so we got to watch the sun set as other inn guests did yoga in the main common area outside our windows. 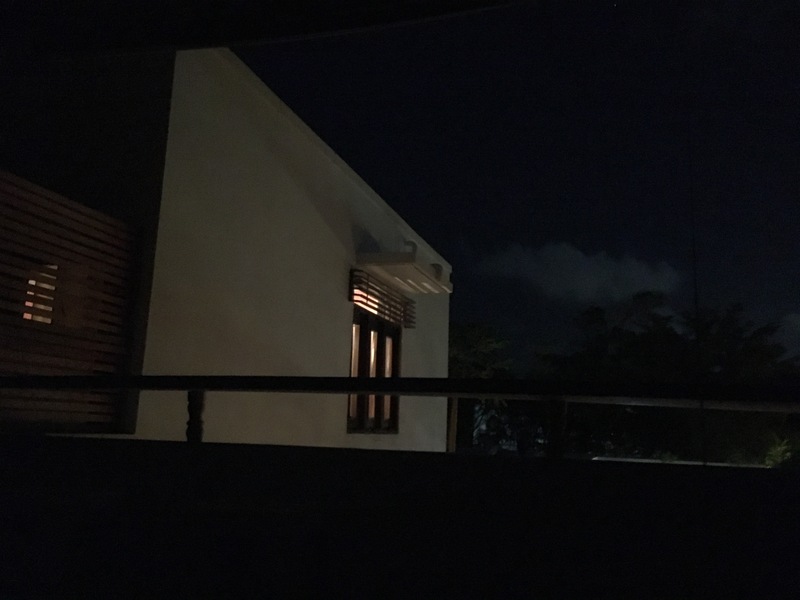 The view from our balcony, looking over at one of the windows, with the night sky in the background. 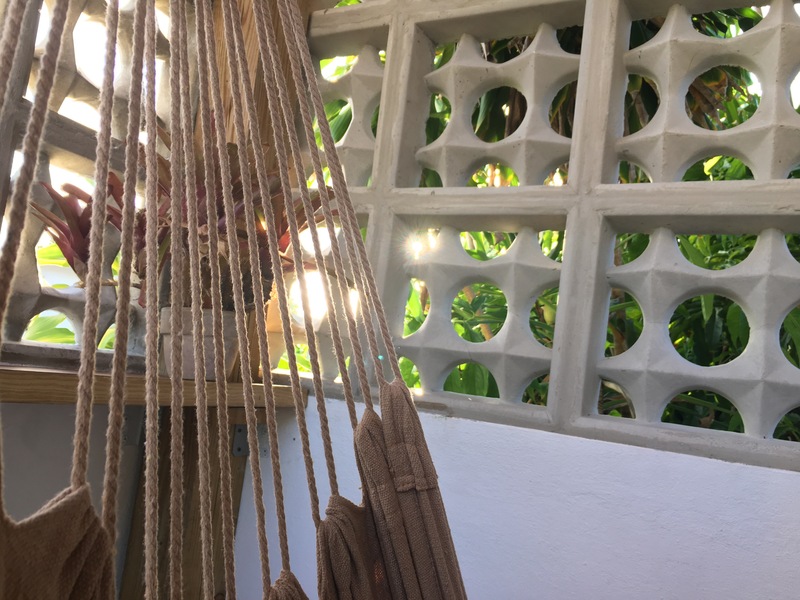 Then, once the sun had really set, we got a quick dinner (ceviche and a chimichanga) and strolled back to read and swing in the hammock and luxuriate in all this ridiculously warm weather. Tomorrow, we’re heading off to the East Coast of Puerto Rico. We’re also taking an adventure there that I can’t even describe, but I will HOPEFULLY get good pictures to share. STAY TUNED!